Amazon comes out with new tools and features regularly, but nothing has been as exciting and interesting to me as a manager of brands on Amazon, than the Storefront. Essentially, the Storefront is a website/landing page within Amazon that connects your shoppers directly to your product detail pages. Why is a Storefront a Marketer’s Best Friend for Increasing Conversion on Amazon? You can include an unlimited number of videos, prominently located next to “Add to Cart” buttons. You can design a custom landing page using Amazon’s drag and drop tile building tool. You can give shoppers on Amazon a curated, flawless view of your products, rather than a characterless, uninteresting search results list. You can bring a customer into your brand’s world, and show them what they should buy. The Storefront is within the Amazon ecosystem, and therefore can be referred to in responses to customers, whether in product reviews, emails, or Q&A. How should a Storefront be built? As a general statement, a Storefront should reflect the character of the brand. But, how to create and curate this on Amazon? One of the easiest ways to do this is to reflect the time, effort, blood, sweat, and tears you’ve put into your website, and put that format and structure into the Amazon Storefront. This helps you continue to remain coherent in your approach to customers in telling your brand story, and it also reduces your time and effort in creating it. 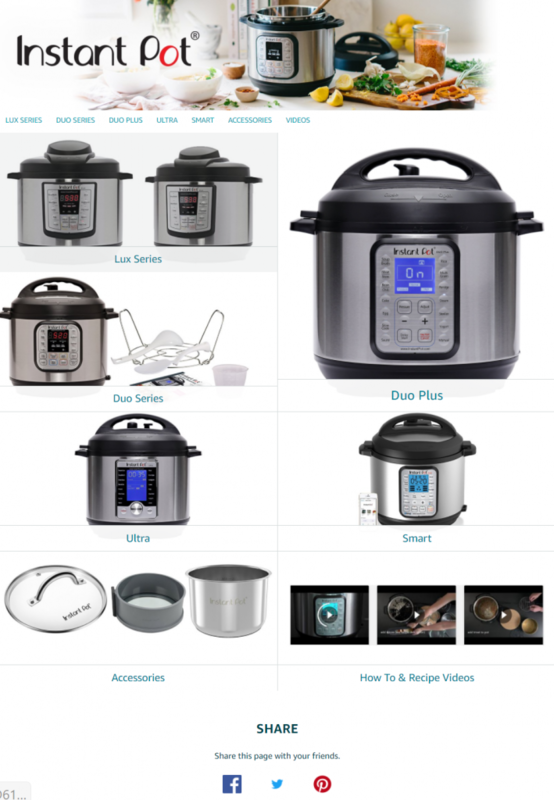 Instant Pot has done this very well on Amazon, with a very nice Storefront that showcases their product lines clearly and allows the customer to click from an image of the product on the main page of the Storefront, to the landing pages for that product. They then have all of their information videos in one tab. This is a simple and effective way to organize your Storefront. My preferred approach is to have the main page be similar to the main page of the website – you’ve spent a long time developing that, after all, with the whole catalog on one page as well, just to make sure it’s present for anyone looking for that. But the primary goal of the Storefront is to drive additional traffic and sales. As such, your Storefront needs to be helping people decide what to buy, and that means a solid landing page. 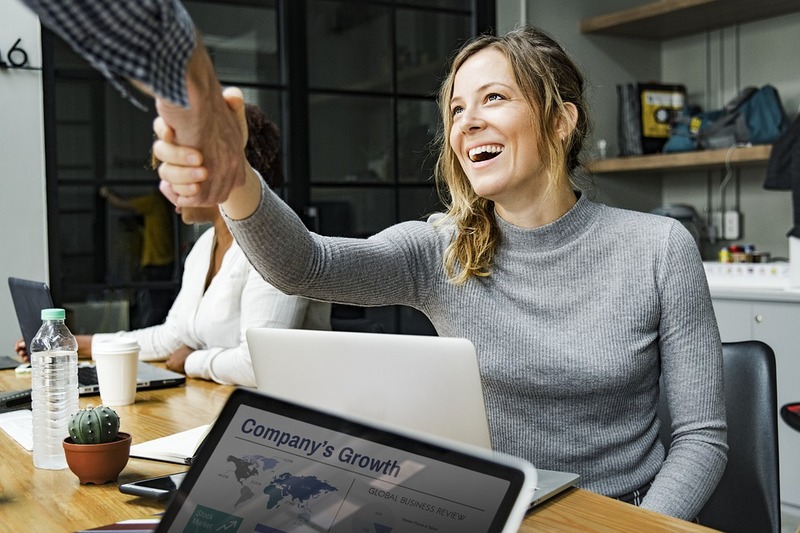 Whether you’re directing to your Storefront via email, or you’re directing them through Facebook ads, or whether you’ve created a special landing page for a particular influencer campaign, you have the opportunity to convert that visitor into a customer. Taking the approach of what you would find in a landing page (pain/solution to pain), with a how-to insert (how the pain is solved) can be highly effective in that conversion. Why is a bad Storefront is worse than no Storefront at all? This may be surprising to hear, but if you’re not going to put in the same amount of time and effort on a Storefront (or investment in a marketing agency) that you would on your own website, you shouldn’t have one at all. 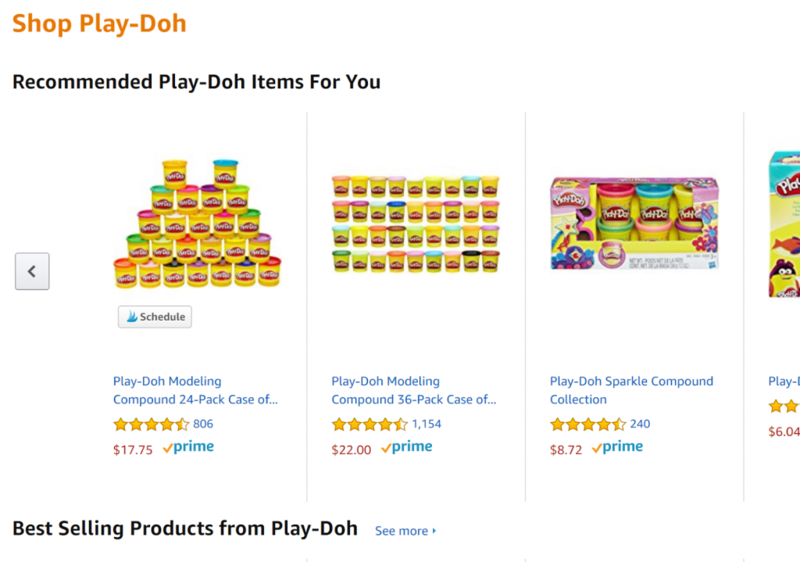 This page from Play-Doh starts with recommendations based on search history, a Best Selling products carousel, and then a full list of all items listed under the Play-Doh brand. A poor Storefront uses the main page template and that’s it. What this does is severely limit your potential reach to customers. In a recent brand review to prepare for a potential prospect’s information call with Cascadia, I noted that their new Storefront was featuring two products with limited reviews that averaged 3 stars, and worse, had no catalog whatsoever. My only choice to review the prospect’s catalog on Amazon was to search for their brand name on Amazon and sift through the results. By not taking the Storefront seriously as a unique tool for brands to use on Amazon, and investing time and effort into the creation of that Storefront, this brand had severely limited their potential reach with customers, and almost guaranteed poor conversion, by highlighting poorly reviewed products. They would have been better off with a boring results page like Play-Doh. Here are other ways to maximize your amazon potential. Every Storefront is a story you’re telling customers about your brand. What will that story be? Want help managing or launching an Amazon store?